Rattigan’s play deals with a teacher about to be turfed-out after 18 years of contributing strict and rather boring lectures in Latin & Greek prose. The rationale may be either medical or just administrative desire for new blood. Professor Andrew Crocker-Harris is as straight-laced as his name and just as dour and pedantic. His wife is just the opposite and she makes her own fun. Director George Thomas has conscripted a cast that not only capture the essences of their characters, they physically mirror the stereotypes. Peter Lloyd brings every movement, pause, stance and even blank façade to portray the humorless teacher. The acting is so expressive as to recall the pre-talkie movies of yore. His wife; and the infidelitess [sic] of the piece is Jo Kemp who we must admit to adoring; both as an actress and a friend. We’ve critiqued her numerous times and always seem to run out of superlatives. This is another such occasion. Suffice – she’s super. The Headmaster’s role must have been written with a Tim Hevesi in mind. He looks and projects every nuance of his character. Kemp’s paramour is Mike Wierenga who brings a credibility and obvious sincerity to his changing attitude towards Kemp. Bestowed generous applause even though he (on-stage) broke Jo’s heart! The school’s replacement couple are played by Alexandra Pope & Gabe Camozzi. Unfortunately, the roles are almost cameo so one isn’t given much opportunity to witness them on stage. A pivotal role is that of student ‘Taplow’ whose gift to Crocker-Harris brings on his metamorphosis. Gareth Finnigan is a strong young actor but his projection needs upgrading… he has some of the most potent dialogue but alas, much of it was missed by these venerable ears. With any thrust-stage set up, a director must constantly modify his or her performer’s blocking. “How her lied to her husband”. This somewhat diminutive one-act play was a first-time exposure for this scribe. The story-line by G.B. Shaw mirrors his ‘Candida’ and contains four characters. Director Tamara Kamermans brings two actors from the above – Gabe Camozzi & Tim Hevesi to play opposite another of our favorites- Dia Frid. The fourth hand is Georgina and although she is catalytic to the plot – we never see her. Briefly, the plot concerns a middle-aged London woman with pretensions; her younger lover and of course, the cuckolded husband. The aforementioned ‘Georgina’ is the meddlesome sister-in-law. The opening pantomimes in search of the misplaced love poems to ‘Aurora’, aka Darling Dia; and Camozzi’s pre-proposing are both hilarious and summa acting opportunities. When Hubby arrives with the purloined prose in hand; Hevesi psyches Camozzi’s attempts to misdirect the supposed salutary from Aurora (Bompas) to ‘Aurora’[ Goddess of the dawn]. He fails. 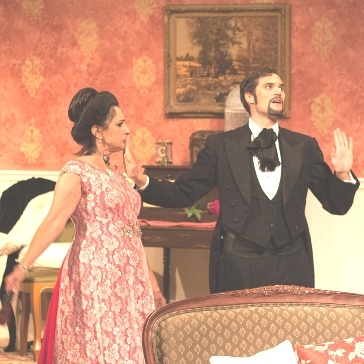 The play requires some extreme over-acting and all three manage to stay on the right side of hamminess, albeit the [almost] fight scenes DO slip into farce. Camozzi’s pugilistic -stance mirrors all four of the ‘Big Bang Theory’ protagonists. The dénouement may be telegraphed but the thespian echelon of the performer’s keeps audience attention glued until curtain. 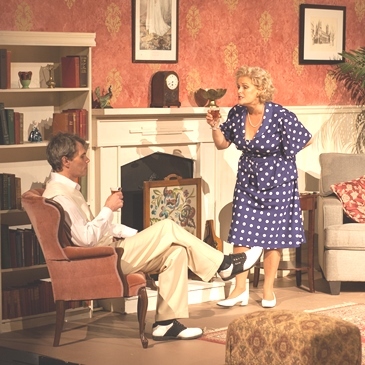 Both plays are on stage at the Garstin Centre in Dundas until Nov. 9th. Call 905-627-5266 for tickets.